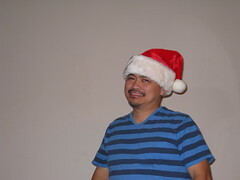 It's Santa Hat Day! This is my entry. Very plain, IMO. I'm too shy to do that. Hehehehe. Well, put the hat over your crotch, then, and smile for the camera! Yes, but you have a big blank wall next to you. Photoshop can clear up a background right quick.